The merits & problems of ProPhoto is a topic that comes up over and over again in digital imaging discussions. In many ways the point is now moot - as tools like Lightroom for example use ProPhoto in the background whether you like it or not. But it's still worth understanding the implications of ProPhoto and it's still definitely relevant for any works you export from raw to a finished image. Here's a long article - originally from 2005! - that discusses the issues in depth. Because I am asked so often about this, I just wanted to write a few notes on the negatives of using ProPhoto, because a lot of people are glossing over them. And there are some big potential negatives of using ProPhoto over the (still) more popular and established AdobeRGB. It's not that ProPhoto is never appropriate, its just that, if used incorrectly, it can lead to some real, tangible problems in your editing and printing that can be very frustrating. Like all things in digital imaging, your decision to use (or not use) ProPhoto should be an explicit, informed decision based on real knowledge and testing, not just word of mouth and internet mythology! You're not going to really understand this discussion if you don't know a few basics about Colour Spaces. If any of the following facts (in the Colour Space basics section) are a surprise to you, or you simply don't know what they mean, then you really need to bolster your knowledge of basic colour management (especially before considering the use of ProPhoto!). 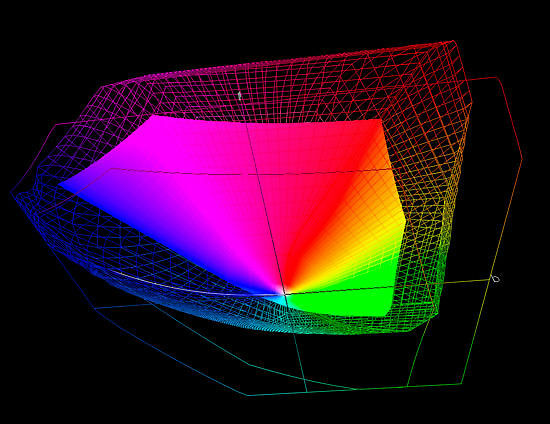 We have comprehensive notes on colour management in our online Fundamentals of Digital Book. This is probably the quickest and most effective way to get up to speed on digital colour. If you want to print your images to the highest levels possible at this time, you simply must understand digital colour management. If you don't, you'll always be left at the mercy of guesswork and the fairly poor practices of most labs, and you will be relying on little more than blind luck when it comes to print quality. 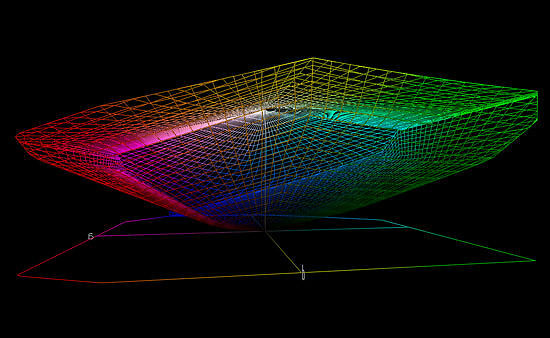 All colour spaces of the same bit depth (typically 8 or 16 bit) have the same total number of tones. That is, a bigger colour space does not mean there are more colours in total! 8 bits = 256 tones per channel (i.e. possible red values of 0 to 255), 16 bits - 65536 tones per channel. Even the best monitors struggle to display 98% of Adobe RGB. Unless the screen you are looking at cost in the region of $AU 7500 or more, then the odds are your monitor's gamut is only slightly larger than sRGb and about one third of the size of ProPhoto. 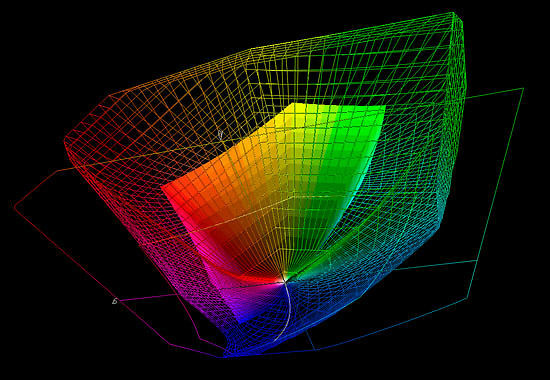 Simply put, RGB Primaries are either real (colours visible to the human eye) or imaginary (theoretical colours not visible to the human eye). ProPhoto's blue and green primaries are imaginary. Although printer drivers are almost all 8 bit, doing your edits in 16 bits will give you better results. The final conversion to 8 bits should happen only immediately before printing. Using ProPhoto with 8 bit files is digital imaging suicide! It is incredibly easy to introduce banding to a file in 8-bit ProPhoto. Nothing makes a digital image look crappy quicker than banding (except maybe the Unsharp Mask in most people's hands, but that will have to wait for another article!). ProPhoto is so large that having only 255 possible shades of each of Red, Blue and Green is a BIG PROBLEM! Quite simply the distance between tones is so vast you are almost guaranteed banding with only slight manipulations, especially if you try and recover detail in a slightly underexposed area of an image, i.e. the shadows. We might use ProPhoto simply because it is MASSIVE. 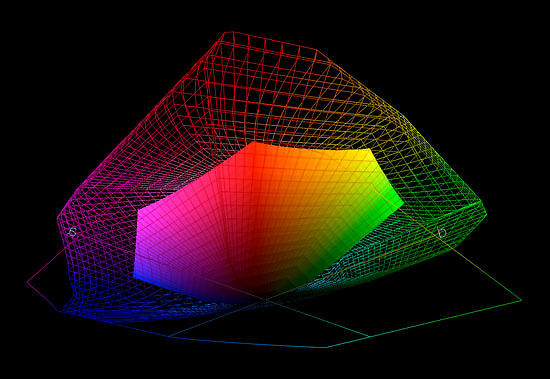 It is the only commonly used device independent colour space that (almost) completely contains the gamuts of all likely to be encountered device dependent colour spaces. This is a very powerful argument in favour of ProPhoto. It is a stronger argument if your capture device is a newer high quality scanner (like the Imacon Flextight) or a very modern digital SLR (like the Nikon D2X, Canon 1DS etc), as older devices rarely had chips in them capable of measuring colours outside of AdobeRGB (indeed, for many, sRGB was approximately the limit). But modern dSLRs and Scanners DO have sensors in them that can measure colours outside outside of AdobeRGB (though usually not that far out) . Tying in to the whole obsession with technical perfection (rather than image improvement) that many professionals rather sneeringly refer to as 'Camera Clubism' (or perhaps, 'Camera Clubitis'), the basic argument for using ProPhoto as the destination colour space in your RAW converter and/or scanning software, is that then there is no chance of losing anything in the future. ProPhoto can contain almost every tone your camera/film/scanner can capture (and usually way more), so you are never losing colour information (i.e. clipping channels) (that is - above and beyond the colour information inherently lost by the sensor). An obvious argument at this point would be that it makes more sense to keep the RAW file (or DNG file) and re-process that to task, using the best available technology/colour space at any particular moment. As soon as you convert from RAW to ProPhoto (or convert the image from your scanner's colour space to ProPhoto, as the case may be), you have already made decisions and lost some information available to you in the RAW format. So ProPhoto is not really the best storage space for archiving digital images either - although a ProPhoto TIFF file is likely to be more compatible in the future than your camera's RAW format. Some RAW formats from early dSLRs already do not open in current versions of RAW converter software! Adobe's DNG may solve that problem. Converting from RAW into ProPhoto makes some sense, as you will likely not run into ANY significant clipping issues. Having said that, it is not actually common that your images will contain tones outside of AdobeRGB. It tends to be only image with extremely saturated colour (particularly yellows) that raise this problem. This is easily seen using the histogram in Adobe Camera Raw. Really, if your original capture does not contain tones out of the gamut of AdobeRGB, then there is no point whatsoever (and quite a few negatives) in using ProPhoto as your colour space unless you plan to artificially manipulate the saturation of your image to a considerable degree. Professional photographers know how hard it is to make a truly worthy image. Amateurs always believe they might get lucky and take one one day. Professionals are generally in the business of image creation, amateurs in the business of image capture. Professionals want an excellent print now, amateurs want a perfect print someday. Professionals are rarely professional but usually pragmatic. Amateurs are often very professional but never pragmatic. Of course, you'd be wrong if you looked at it that way. But not completely - working photographers are generally more interested in getting good results in limited time spans, with a sensible budget and necessarily acknowledging the limitations of the equipment they are currently working with. Hobby photographers have the luxury of testing things at infinitum, and believe that MTF numbers are actually important. Working photographers are interested in techniques that will make their work look good now (and thus get them more work) and hobbyists look at things with a long time point of view - they can get their images beautifully scanned later, and can try the same image in many forms of print over many years. Professionals tend to be Output Centric (what will work now for good results) and hobbyists Wundershot! Centric (how can I be sure to take advantage of that once in a lifetime perfect shot moment, and how can I print that beautifully (obsessing over every detail), for years to come?) . Both are, of course, valid in their own right - however if you go too far down the Wundershot! path you may well find you've shot yourself in the foot and are missing out on great prints now, for the hope of something that may never eventuate later. What on earth does this have to do with ProPhoto? Well, I'm glad you asked. It has to do with the gamuts of current output devices. They're not that big. Certainly, in volume terms, they are ALL pretty much smaller than even AdobeRGB. This includes - Lightjets, Lamdas (see Figure 5), Thetas, Pegasusses (Pegasi? ), Canon, HP and Epson inkjets (see Figure 4), Dye Subs, and You-Name-Its. Not one of them has a gamut larger than AdobeRGB in total. However, some (many) do have gamuts that do not completely overlap AdobeRGB. In some case, as much as 5 to 10% of their gamut may be out of Adobe RGB. Typically, it is saturated yellows that are the culprits (sometimes very saturated cyans and magentas, too, although this is less common). So, unless you are shooting canaries (or more realistically, very unusually intense sunsets - see Figure 6), almost all of the tones you can print or are likely to be able to print in the short to mid term future, are nicely contained within AdobeRGB. So working in Adobe RGB rather than ProPhoto RGB makes more sense (you'll see why in a moment). Of course, for those images that DO contain out of Adobe RGB gamut colours that ARE printable, you probably would choose ProPhoto. But you'd be doing so for a sensible, distinct reason. Remember - A huge proportion of the best, award winning, life changing, emotive and technically stunning photographs from recent years have been printed from AdobeRGB (using good output profiles of course). Not enough saturated tones in there for you? I doubt it. Even saturated shots of an Aussie sunrise don't fall out of the AdobeRGB gamut. Would ProPhoto have been a better colour space to use? Not very often at all. Will using ProPhoto make your imagery better? Not very often at all. Will it make it worse? Sometimes - almost certainly. Anyway, this brings us to why smaller is better in colour spaces (given of course we're not clipping). The ideal colour space for any particular image is that colour space which does not clip any tones, i.e. is just large enough to contain the most saturated tones in a scene, but is no larger. To para-phrase the bullet points above - the bigger a colour space, the bigger the gaps between tones, and the greater likelihood for banding (remember, all colour spaces of the same bit depth, regardless of size, have the same total number of tones). In 8 bit, this means we'll VERY often get banding with ProPhoto. You might say in 16 bit there are so many tones available to us it is impossible to get banding. It's true it is much less of a problem, but because of the non-liner nature of this particular beast, this is definitely not true in shadows. Also, the reality is, that Photoshop's maths tends to accumulate rounding errors pretty quickly - the net effect of which is tones falling into the same 'buckets' - you may well find that those 5 adjustment layers you are using, to take your image from good to wonderful, can very quickly cause banding in ProPhoto. None are so blind as those who cannot see. Another big reason to be wary of using ProPhoto is the simple fact you can not see most of it! Your monitor's gamut is typically approximately a third of the size of ProPhoto (see Figure 7). Two thirds of the tones storable in ProPhoto can simply never be seen by you on your screen (or in a print)! If you make a fairly common adjustment, say +10% saturation, to an image that is already reasonably saturated, there is an excellent chance you will not be able to see with any accuracy what is happening to the numbers in your file. 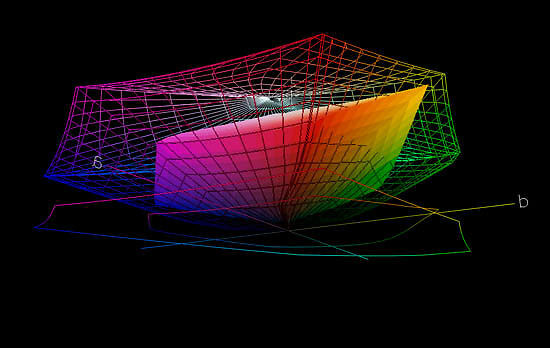 (Remember, out of gamut colours for your monitor are always mapped back in by PS using Relative Colorimetric). This is a BIG problem and the one I see the practical results of very often - soft proofing files with large proportions of numbers well out of your monitor's and/or printer's gamut can be very problematic. Another problem with ProPhoto is that, especially with some less than subtle edits, a large proportion of tones in a file often end up well out of gamut for the output device. This means when it comes to output, these tones must be mapped back in to gamut. There are four rendering intents available to do this in Photoshop - only perceptual and relative colourmetric are really useful in practice. In both cases, to bring these well out of gamut tones back into gamut, some pretty funk maths has to occur - the further out of gamut the colours are, the more funky the maths. In practice, this can make achieving a fine, smooth print that much harder. Adobe RGB was designed to be specifically quite close to the gamut's of output devices, so this is less of a problem. Photoshop's tools offer only one level of finesse regardless of the colour space we are using. ProPhoto is so wide that sometimes even the minimum 1% change in Photoshop is too much. 100% stretched out over such a vast space makes 1% a significant change. Be wary of making any big changes in ProPhoto (especially as you will quickly run into the edges of your monitor's gamut and hence will not be able to really see those changes!). Going from an ok print to a great print is often the result of very, very subtle manipulations to the source file - subtle changes, very targeted, and with real meaning. Sometimes this subtlety can be harder to achieve in ProPhoto than other colour spaces. If you do not do your own printing, and have labs print your work, be aware also that almost ALL labs (at least in Australia) are pretty much woeful when it comes to colour management. Almost all of them use production systems based around sRGB (yikes!) or AdobeRGB - most don't even really know what ProPhoto RGB is! 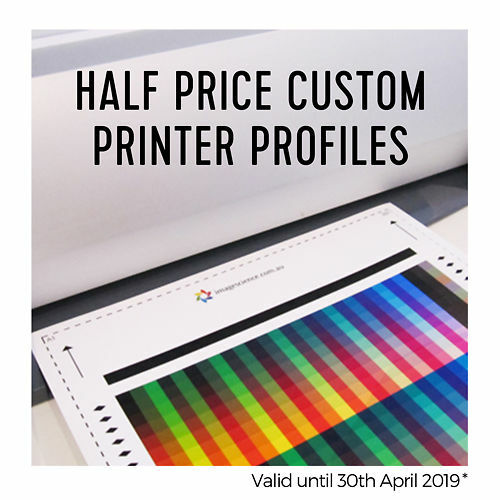 If you throw a file at them with colours significantly outside of the AdobeRGB gamut you are almost guaranteed to get back a truly rubbish print, and they'll happily charge you for the privilege. Also, the ACMP here in Australia (professional body for Commercial Photographers) have standards for digital files - namely, that those files are supplied in AdobeRGB. Banding is always a very real possibility with ProPhoto, even in 16 bit areas - watch those shadows in particular! While some devices can capture tones outside of AdobeRGB, a fair majority of real images do not contain these tones. Pure, saturated yellows are one area to watch out for, and the one area where printers generally exceed the gamut of AdobeRGB. Saturated yellows that strong aren't actually that common at all (birds are one area you're likely to encounter those yellows). It is easy to inadvertently make bigger changes than we wish/thought we were in ProPhoto. ProPhoto IS the right choice in some cases. But understand why you are using it and the consequences of your decision, and you will get better results. Labs (at least in Australia) regard ProPhoto as the digital equivalent of Swahili. If you have a need to use ProPhoto, supply the final file to them as AdobeRGB. Don't just take this as gospel. Do you own tests and see if I'm right. 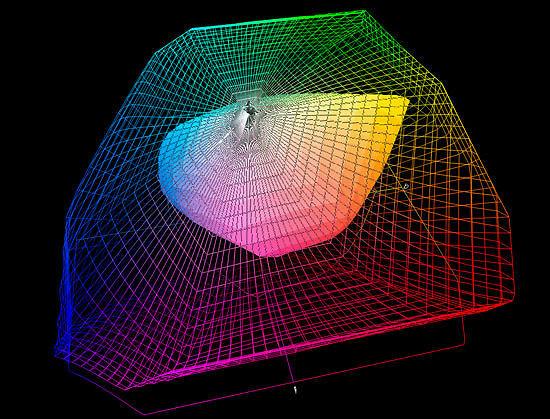 Use Colorthink and the Image Science profile service to plot the gamut of your printer versus AdobeRGB and ProPhoto. Try some edits on an 8 bit ProPhoto file and see the banding in deep shadows for yourself. Try and find an image from your dSLR that has significant colour outside of the AdobeRGB gamut. Process the same file (try a typical portrait AND a lovely sunset) in both ProPhoto and Adobe RGB and see which prints you like better. 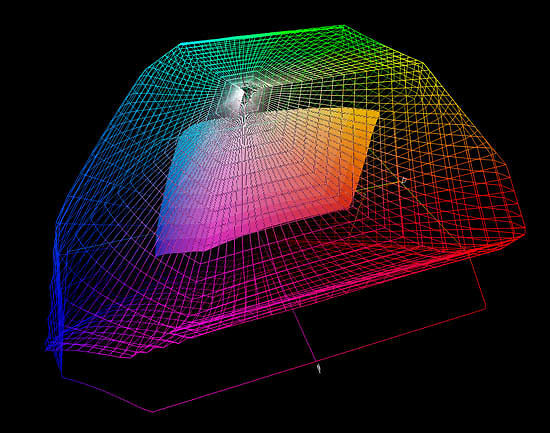 Calibrate and profile your monitor and see its puny gamut compared to ProPhoto. Prove to yourself that you've made the right decision and that you know why you've made that decision! I just received my photo print. It looks just how I wanted it to! Thank you so much. You were so helpful and professional, and lovely to deal with. I have plenty more to have printed and will contact you again. Thanks so much again!